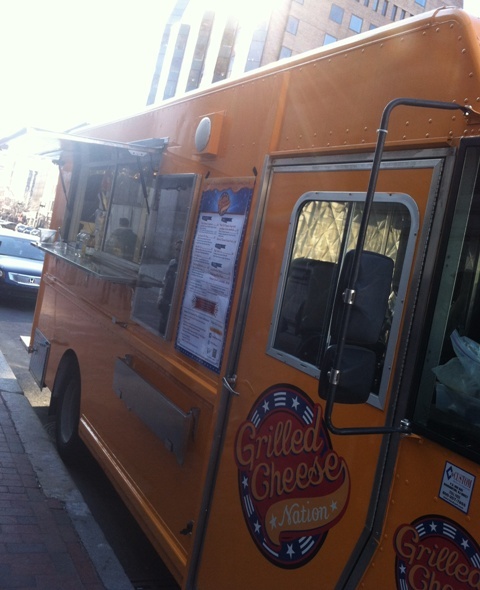 If you are a food truck lover like I am, then you would appreciate the amazing simplicity of this truck – Grilled Cheese Nation Food Truck in Boston, MA. I will admit I have a lot of “favorite foods”, but you can always get to my heart through a grilled cheese sammie. This wonderful American favorite originated in the 1920’s due to the abundance of inexpensive cheese and bread during the Great Depression. Nothing about a grilled cheese makes me depressed. I was lucky enough to have a chat with the owner of Grilled Cheese Nation and founder of the Boston Area Food Truck Association. For one, he and his members are fighting to get a larger food trucks presence in the city of Boston which is a kind-of-a-big-deal, and super respectable. Secondly, he is killing it with the grilled cheese options at his truck! Seriously. I can only share a photo of the menu and not of the actual food because I scarfed it all down waaay before I could say “cheese” (hehe get it?). The Boston Common: Aged Mild Vermont Cheddar with Applewood Smoked Bacon on Iggy’s Organic Pain de Mie Bread. Brie Me Up: Melted Creamy Brie with Sliced Asian Pear on Iggy’s Organic Wheat Pain de Mie Bread. The Blue Man Goo: Great Hill Blue Cheese and Organic Fig Spread with Aged Balsamic on Iggy’s Raisin Pecan Bread. HOLY GRANOLI. That blew my mind. The salt of the blue cheese, the sweetness of the fig spread, the tart flavor of the balsamic, all pressed and grilled in a sweet and nutty bread. Man oh man, this is a must try. What made this even better (since it was cold at the time), was their shot’s of tomato soup to accompany my grilled cheeses. What a combo! If you are ever in the Boston area, you need to get your hands on one of these delicious sammies. 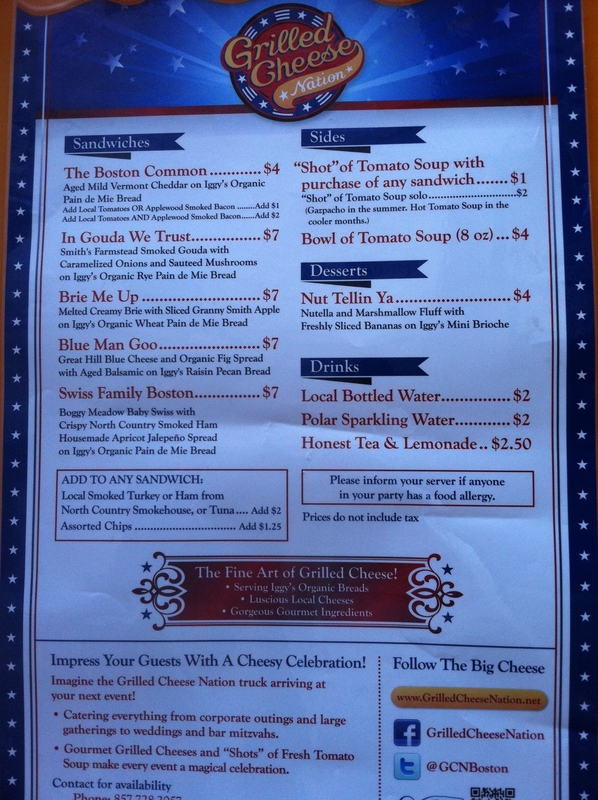 You can find Grilled Cheese Nation’s schedule here or call: 857-728-2057. This entry was posted on Tuesday, August 14th, 2012 at 12:34 pm	and posted in Bite This, Food Trucks, Travel Bites. You can follow any responses to this entry through the RSS 2.0 feed.